No one likes to think of once treasured possessions going to landfill. Whilst we may not be able to use items that are past their useful life, our companions will clean up and repaint wherever we can. This means we can reduce landfill by selling on as many of the items we collect as possible through our shops. 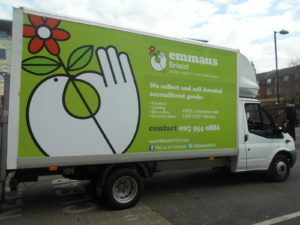 Here at Emmaus Bristol, we raise funds to provide accommodation, food, work and support services to those who have previously experienced homelessness and who want to make a change in their lives. We raise the majority of this money through developing social enterprises such as the House Clearance and Portable Appliance Testing Services as well as running several retail spaces. This means that when you choose to book a service or make a purchase with Emmaus Bristol, you know your payment is going to help people to support themselves out of homelessness. Our surplus income is used to provide companions with a home, training and ongoing support to rebuild their lives. We are an active charity, not one providing passive hand-outs; those supported by its funds are also engaged in the work of its social enterprises. Click here for firsthand accounts of the difference you can make by using our House Clearance Service.